As you can see in the left pane of the dialog window, you can organize your set commands into batches. Each batch is a list of set commands that are processed at once. You can create an unlimited number of batches, and each batch can have as many set commands as you need. In the batches pane, you can see all your batches listed. To add a new Batch, please click on an existing batch and then click on the button “+ Add”. To remove a Batch, select it and then click on the button “- Del”. All defined set commands in that batch will be deleted along with the batch. 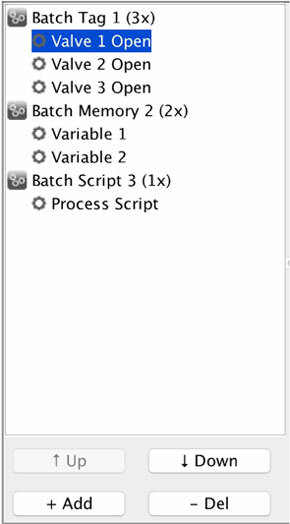 To add a batch item, please select a set command in the corresponding batch and then click on the button “+ Add”. The new batch item is added to the end of the batch list. To remove a batch item, please select a set command in the corresponding batch and then click on the button “- Del”.